Janet Dailey. You’ll be greatly missed. Readers everywhere were saddened to learn of the recent passing of romance icon JANET DAILEY. She published her first book in 1976 and is the author of approximately 100 books with sales totalling over 325 million copies across 89 counties and translated in 19 languages. I was not only a fan of her books, particularly the Calder Series, I also had the privilege of meeting her on several occasions but one in particular was memorable. Here’s the article I wrote at the time and it’s about her first boss attending a booksigning! December is such a busy month but it’s lovely to be able to sit down and relax with a good books. SISTERS FOUND by author JOAN JOHNSTON and BLOOD RED by HEATHER GRAHAM are both reader favorite reissues and sure to provide the relaxation needed. Writing as MARY ELLEN TAYLOR, Mary has a new trade paperback out called SWEET EXPECTATIONS, the sequel to THE UNION STREET BAKERY. You’ll get a peek behind the scenes at the Union Street Bakery and into the lives of the McCrae sisters, Daisy, Rachel and Margaret. There’s another mystery to unravel and a persistent ghost as Daisy finds a way to make the bakery her forever home. Mary has added some delicious recipes on her website, too, just in time for holiday baking. And you’ll want to bake after reading this “delicious” new novel! It’s been a week since the 33rd annual conference of Romance Writers of America concluded in Atlanta, Georgia and the boost I received by attending will last me until the the next one in San Antonio a year from now. I’ve been an RWA member for about thirty years and have attended countless RWA annual conferences around the country so I should be jaded by now. But I’m not. This conference kicked off with approximately 400 authors including Heather Graham, Cathy Maxwell, Carla Neggers and Mary Burton autographing books in an event open to the public. All proceeds went to literacy and approximately $55,000 was raised. HEATHER GRAHAM and CATHY MAXWELL and CARLA NEGGERS have a new original book, a fan favorite reissue and an exclusive FREE enovella to keep readers more than entertained this month. KEEPER OF THE DAWN by Heather Graham: In their new Keeper roles, these extraordinary women must balance the fate of the world with their desires? Alessande Salisbrooke has been warned about the legend of the old Hildegard Tomb—how human sacrifices are being carried out by the followers of a shape-shifting magician. As a Keeper, Alessande understands the risks of investigating, but she can’t shake the nagging feeling that the killings are tied to a friend’s recent murder, and she can’t turn her back. New York Times bestselling author Carla Neggers is offering two books from her acclaimed romantic suspense Sharpe & Donovan series in this month’s book drawing. 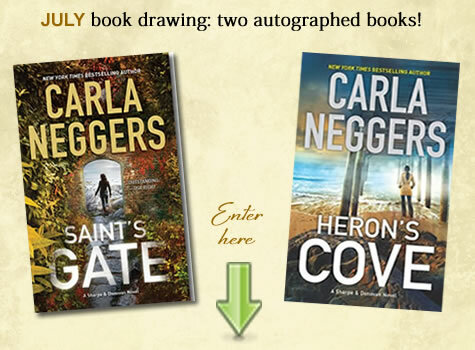 Enter to win signed copies of SAINT’S GATE and HERON’S COVE. Drawing ends July 31st. DECLAN’S CROSS is the third novel in this series and will be released on August 27th. Read the untold story of one of her most beloved series characters in a special prequel, ROCK POINT, an e-novella which is FREE to download from July 1 – August 31st. Order, read more and watch a special video here.